You can still sign up for classes. NEW! Qi Gong (senior/adult) - Wednesday 1 – 3 p.m. Exercises can be performed standing or sitting and combine coordination of deep breathing with body movements. This is a free class. Registration is optional. Yoga: Vinyassa Flow (adult) - Saturday 9:15-10:15 am. Start you weekend with a lovely Vinyassa flow. Youth Flag Football Team (11-13 yrs) - Wednesday 4:30 - 5:30 pm. Looking for a program for your tweenager? A few spots are still available. Petite Bakers (3 – 5 yrs) - Tuesday 10:15 - 11:15 am. Drop ins are welcome. Girls Volleyball (7 – 9 yrs) - Wednesday 4-5:30 pm & (10 – 14 yrs) - Friday 4-5:30 pm. The younger group focuses on skills development while the older group engages in league play. Go ahead and spike it! FNVRC has hosted one or two major events yearly (Cinco de Noe, History Day, several Movie Nights, Ice Cream and Swing dance, an Easter Egg Hunt, a Halloween Carnival), as well as presenting monthly free concerts, quarterly gardening parties, and more. In between there have been grant applications, equipment and furniture purchases, website and newsletter updates, fundraising, lobbying for maintenance and improvements, and just keeping an eye on the park to maintain it as a safe and enjoyable environment for all. We are especially proud of the partnerships that have formed. Most recently, FNVRC joined with Climate Action Now to bring more attention and care to our Native Plant Garden, and with the Fairmount PTA to raise fun and funds for our local school. Looking to the future, FNVRC is considering a couple of big projects. Repaving the exterior basketball court is one. 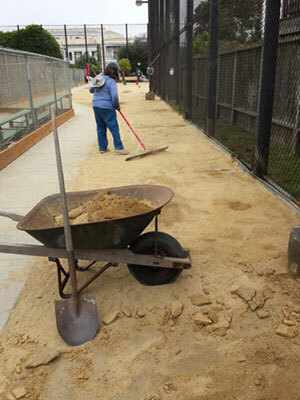 Another is improving amenities for the large number of daily visitors to the sun-baked dog run. Is there something else you would want for the park? Projects like these require considerable fund-raising and, probably more importantly, active participation from the community. To that end, FNVRC is looking to bring fresh faces into its ranks. It has been seven years since the renovation. The neighborhood has seen change. The children who used Upper Noe then have grown up and on to other activities. Families have moved away, including dedicated FNVRC committee members. New families have move in with fresh perspectives on our community. FNVRC needs that energy and creative vision to help keep Upper Noe Recreation Center the beautiful, vibrant neighborhood center that has served us all so well. Contact chris@noevalleyreccenter.com. The project to improve the trail connecting Billy Goat Hill with Walter Haas Park is moving forward. SFRPD is soliciting bids from contractors and has already posted notices for removal of hazardous trees along the trail path. SF Rec & Park (SFRPD) approved the final plan and it looks like construction is imminent according to Lisa Ghotbi of Friends of Billy Goat Hill Park . The path will be essentially unchanged from what SFRPD presented in May. At that time, neighbors walked the trail with project manager Lisa Wayne and offered feedback. They sought fewer steps, retention of the woodsy experience of the existing trail path, and a more practical alignment of the lower entrance. “In summary, the assessment is they do not see much opportunity to reduce the number of box steps and the entrance for the trail will remain as originally proposed. There is some opportunity to use more of the western slope to extend the trail into the woods to improve the hiker experience and perhaps to move the upper turn closer to the existing social trail,” says Ghotbi. Whatever the path, the linking of two popular recreation sites with a safe and attractive trail will create opportunities for families and hikers. 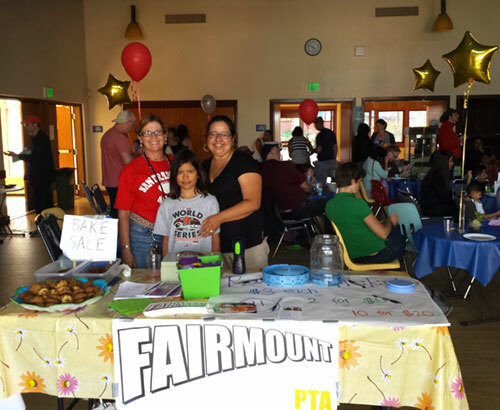 On August 1, the Upper Noe community Recreation Council (CRC) teamed up with Fairmount Elementary School PTA to host Movie Night. It was a spectacular event. At least 150 children and parents came to watch the movie Cars, munch on popcorn, and devour hundreds of slices of pizza, salads, and gallons of tea and lemonade. The event raised hundreds of dollars for the arts, field trips, and after-school programs at Fairmount. We want to thank our local merchants for their fabulous food and raffle prize donations: Bom Dia Market, Bricks 4 Kidz, Chuck’s Sun Valley Grocery, Church Produce, Curator, DAVIDsTEA, E & J Market, Edible Excursions, K9 Scrub Club, La Ciccia, Olive This Olive That, One Stop Party Shop, Pomelo, The Buzz, Twin Peaks Pizza, Café XO. There is always something to do around Joby’s Run. Hundreds of dogs and humans every day take a toll. Keeping it a pleasant place to visit requires regular upkeep and grooming. The dogs push the decomposed granite surface around so much with all of their romping, stomping, turning and stopping that large amounts of it eventually pile up in the wrong places. On a recent Saturday morning, Friends of Upper Noe Dog Owners Group (FUNDOG) volunteers dug up several tons of the gravel and wheelbarrowed it to thin spots, then re-groomed the entire main area. Lovely! FUNDOG is looking to add a fresh load of gravel to keep the space safe and sanitary. Start the evening with a walk-through of the Greenway. Meet at the BART Plaza at 5:30 pm.